A Terrain Tileset is a mosaic of one or more data sources, layered together and processed for efficient visualization. It is not uncommon for a Terrain Tileset to be generated on one STK Terrain Server, and deployed on a different STK Terrain Server instance. The STK Terrain Server Processed Data product is one example of this use case, where a predefined Terrain Tileset is regularly maintained by Analytical Graphics, Inc. This database, and any other predefined Terrain Tileset database, can be easily incorporated into an existing STK Terrain Server by following the instructions below. Once incorporated into the STK Terrain Server, the Tileset is immediately available for use in Cesium, STK (v10.1.2 or greater) and 3rd Party applications developed to ingest the Quantized-Mesh 1.0 open format. Copy the [tileset].terraindb file directly to the machine hosting the STK Terrain Server into a location of your preference where the IIS_USRS group has read and write permissions, such as in the [install_path]\stk-terrain\db directory. Navigate to the Tilesets page by clicking on the Tilesets link. Click on the "Import Tileset" button to show the Import Tileset dialog. Assign a unique name to this Tileset. If the "Name" field is left blank, it will be populated with the name of the file as specified in the File Path field. Once imported, the Tileset page will show the information about the Tileset that is populated from the imported file, including the tileset description if available and the list of included data sources with a link to the respective data source page. If any of the included data sources are not already available on the server, a new datasource will be added to the list of Data Sources. The "Name", "Description", and other option fields are automatically populated. The "Directory" field, the Available Files, and Included Files are intentionally left blank, as this data is only relevant on the server that created this imported tileset. To verify the imported Tileset, click the "View on globe" button. If your server is operating on a closed environment, verify that tileset imagery is available. This can be configured by navigating to the STK Terrain Server Settings page. If you do not have access to a public or internal imagery server, the STK Terrain Server provides the Natural Earth II TileMapServiceImagery. The STK Terrain Server requires read and write permission on the directory that contains the terraindb copied in Step 1. 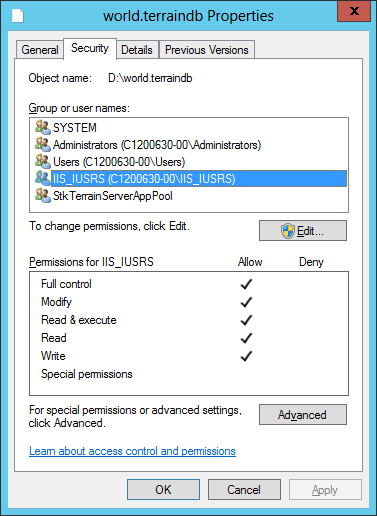 Verify that the IIS_USRS group has read and write permissions for both the terraindb and the directory containing the terraindb file, as shown below.